Another hot and sultry day birding the hotbed of Frodsham Marsh. A walk out to view the evaporating waters of No.6 tank sludge tank and to see the emerging old decaying hedgerow boundary to the long gone fields that once existed before the tank was constructed. A scattered flock of 462 Black-tailed Godwit were either wading through the shallow waters or catching up with a snooze in the siesta sunshine. A lone ‘white-headed’ summer Ruff didn’t take to well to the company and soon departed while a pair of Ringed and a single Little Ringed Plover were tripping over the damp patches. Two family parties of Avocet included 2 adults and 3 juvenile & 2 adult and 2 juvenile birds. Ducks are always a feature no matter what season and the increasing Common Teal flock reached 82 birds, while 34 Common Shelduck and an assortment or scruffy looking drake Mallard were loitering about. A flock of Black-headed Gull included 4 juvenile birds and a handsome adult summer Mediterranean Gull shimmering in the heat haze. A couple of Marsh Harrier were drifting widely over the golden fields while Common Buzzard lazily soared on the warm air currents high above the marshes. What was left of the waters on No.3 tank only attracted a pair of feral Barnacle Goose but not a lot of anything else and the ‘shitigation’ lives on. The Marsh Farm track (Alder Lane) was full of Sand Martins dust bathing while others were sat on the wires above. Again plenty of butterflies about with more sightings of Comma today. Observers: Paul Crawley (5-7), WSM (images 1-4). An early evening walk along Brook Furlong Lane and around to the Weaver Bend. The Blackcap and Chiffchaff are still very much vocal along the lane as was Reed Warbler but alongside the River Weaver. A Marsh Harrier was over Redwall reed bed and c250 Black-tailed Godwit and c40 Avocet, 2 Ringed Plover, 4 Redshank were on the sand bank on the ‘Bend’. Several broods of Common Shelduck of different ages were noted and some males restarting their nuptials. A Tufted Duck female had a brood of 13 ducklings and a Common Sandpiper sat on the bank and watched the water flow by. There were only 2 Common Swift and a handful of Swallow were active over the water. Butterflies were abundant with Meadow Brown, Small Tortoiseshell, Large Skipper, Comma and Ringlet all out in the third consecutive 30* degree sunshine day. The current tinder dry weather caused fire outbreaks at a few hill locations today including this fire on Helsby Hill as seen from Frodsham Marsh. Image by Harriet Louise. A morning ramble out to the Weaver Bend from the Marsh Lane via Brook Furlong Lane. The going was tough in the 28 degree heat and fighting my way through the dense vegetation before emerging on the banks of the River Weaver. The water level was much higher than the previous couple of weeks with the muddy margins covered by the river. The Avocet totals were reflected by the high water level with most of the juvenile (that could fly) and the majority of adults having relocated elsewhere. Those that were left were caring for much younger offspring and totalled c40 birds. A few Common Shelduck were with crèche’s and stuck to the Weaver estuary away from the Great Black-backed Gull that was patrolling the waters. A fresh batch of Ringlet Butterflies were on the banks of the ‘Bend’ and I only managed to collect just the two Cleg bites. There were plenty of Nursery Web Spiders nests about today in the long grass of the banks. I met up with Sparky on Brook Furlong Lane and we headed clockwise around No.6 tank. The ‘Splashing Pool’ had 74 Tufted Duck but the ‘shitigation’ pools were quickly drying out with just a single lame Black-tailed Godwit feeding in the muddy pool. A male Marsh Harrier was hunting on No.2 tank but didn’t venture any nearer. The sweltering heat along the track between No.3 and No.6 was barely tolerable and certainly felt like Hell’s Kitchen but the wider path gave us plenty of space to ward off the Cleg attacks. A couple of Avocet flew up from the hidden pools to see off a Raven and a Ringed Plover calling in the distance were the only other notable birds. No.6 tank had a flock of c843 Black-tailed Godwit and were presumably part of the flock flooded out on the ‘Bend’? A few ducks included 24 Tufted Duck and 43 Common Teal. Observers: Sparky and WSM (images 1 & 4 & 7). A male Stonechat was at Redwall Reedbed per Keith Gallie (images 2-3 & 5-6 & 8-9). Out early this morning with a start from the M56 bridge. A Moorhen was sat on its nest in the ditch alongside Moorditch Lane as I made my way to No.6 tank. There were both Reed and Sedge Warbler warbling away in the reeds. On No.6 a single Avocet fed at the north end and c250 Black-tailed Godwit were at the other end of the diminishing water with a small number of Redshank. Common Shelduck, Tufted Duck, Mallard and Common Teal were all on the water in small numbers and a female Marsh Harrier was sat on its favoured perch in the reed bed. A (released) Red-legged Partridge with its brood made their way along the track and ran for cover as a Kestrel appeared. On No.3 and there were 6 Black-tailed Godwit were on the ‘phalarope pool’ at the extreme west end of that old sludge tank with several Lapwing. On to the Canal Pools and the Mute Swan family were complete with a brood of growing cygnets and keeping company with them were several Coot and Canada Goose broods. There were plenty of other winged critters out today in the glorious sunshine including Meadow Brown, Small Tortoiseshell, Speckled Wood, Ringlet and white’s, not forgetting the blood hungry Cleg biting well, its best to carry repellent with you if you decide to run the gauntlet. Onwards to the Manchester Ship Canal and Weaver estuary where some waders seem to be on the move already. A juvenile Little Ringed Plover and several Ringed Plover, 3 Dunlin, 5 Common Sandpiper, Redshank and more Avocet. 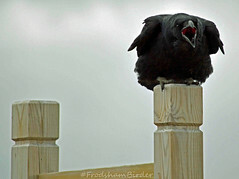 A Raven was disturbed feeding on a long dead sheep on the canal bank but gave its self some distance when it saw me. Lesser and greater Black-backed Gull were on patrol over the river again but were kept at bay by a combined effort of Common Shelduck and its wading equivalent the Avocet. The Avocet troop took their frustration out on me as I passed by and were speeding by just above my head. More Reed and Sedge Warbler were along the river bank and an alarm call from a Magpie brought a Fox to my attention as it made its way through the meadow in search of a tasty morsel. Observer: Paul Ralston (images 1-7). It was Butterflies today with Small Tortoiseshell, Meadow Brown, Large Skipper, Speckled Wood,and fewer White’s all over with 1 Comma on top of the ramp up to No.5 with a Common Blue Damselfly here too. No.6 had 300 Black-tailed Godwit and 20 Redshank. As I said earlier the Clegs were relentless so I gave up after 2 hours. Observer: Paul Crawley (images 7-9 & 11-12). Image 10 by WSM. I had dozens of Small Tortoiseshell butterfly on the track towards the Marsh Farm on a sunny afternoon and a pair of Bullfinch were along Brook Furlong Lane. No.6 had c500 Black-tailed Godwit spread all over the tank and they were spooked by a female Marsh Harrier that almost took my head off as she flew over. There was also 5 Avocet and 3 Dunlin. A small rodent, probably a Bank Vole ran across in front of me too. The “shitigation” lived up to its name, enough said. Why is the bank along the top banks on No.6 tank has been cut back this week as there are nesting birds along here and as your sign a few metres away points out it is a sensitive area? If it’s to maintain the towers :1. The pathway should have been kept clear since February, preventing nest building and 2. The towers aren’t in use now as the water is but a big puddle. Either way they have destroyed nests in breeding season. Out this afternoon with a walk along to the Weaver Bend. It started with a female Marsh Harrier over the river much to the concern of the Avocet and Common Shelducks families. The air above the water was filled with Common Swift, Sand Martin and Swallow speeding overhead while taking a more terrestrial position were Reed Warbler feeding chicks in the reed bed. A flock of c80 Black-tailed Godwit settled down on to the sand bank and fed with a dozen or so Avocet and a small flock of Black-headed Gull. A single Redshank made its way in flight down the river and a Great Crested Grebe was noted. A pair of gulls targeted a crèche of shelducklings and after repeated strikes made off with one each in their bills. Butterflies were out in force with Meadow Brown, Large White, Red Admiral and the ever-increasing Ringlet. A Black-tailed Skimmer was settled on the pathway ahead of me. A male Bullfinch along Brook Furlong Lane, a Cuckoo calling near the old bird log and Avocet and Common Swift to photograph over the River Weaver. There was a lot of activity with Oystercatcher, Avocet and Common Shelduck flying and alarm calling because of the gulls. Observer: Paul Crawley (images 7-9). An after work walk out from Marsh Lane and along Brook Furlong Lane where the hedgerows were still filled with summer bird song. The tunes of Blackcap, Chiffchaff and Cetti’s Warbler were the background music to my walk. After a 15 minute ramble I was on the banks of the River Weaver looking into a stiff breeze coming in from the Irish Sea. The water was filled with c350 Black-headed Gull battling into the wind and feeding on the thousands of airborne fly’s that were hanging above the waves. I was conscious of the number of Avocet that have breed and/or are passing through the area recently. I managed a count of 96 birds with again the majority being adults/ fulling flying juveniles, a fair number of feeding chicks from tiny balls of fluff to leggy young. Several adults (probably 4 birds) were brooding chicks under their bellies and wings, so, I’d estimate that there was over a hundred birds and probably in excess of that. This is now a new record for this species and hopefully to be exceeded in time. There was 3-4 Little Ringed Plover and an adult colour-ringed Ringed Plover, the bird that has been in the area since the Spring and originates from a SCAN ringing programme in North Wales. A Common Sandpiper and (what looked like its) chick were skulking around the edge of the reedy island. A couple of Oystercatcher were busy making a lot of noise while on the ‘bend’ itself were a flock of 634 Black-tailed Godwit feeding in an area that was traditional their first inroads into summering in Cheshire in big numbers. It was great to see this old stomping ground looking like its former brilliant self. The usual Tufted Duck and Canada Goose flocks were again present on the Weaver estuary. The low flying Common Swift certainly tested my reaction of pressing finger to camera shutter button and capturing blank space or blurred image. Also adding value were both Sand and House Martin feeding closely overhead. I wanted to check the godwit flock on No.6 tank and really didn’t expect to see much considering the large flock on the ‘bend’ when I eventually arrived it was surprising to see a group of 583 birds roosting in a tight bunch in the shallow waters. Apart from a couple of Lapwing that was about that. The ducks were very much in reduced numbers with 31 Common Teal ans barely double figures in Mallard and Common Shelduck. A couple of distant Marsh Harrier added to a great evenings watch on the marshes.